Rob Barnett reviewed this fine “Hickox Legacy” Chandos reissue and I agree with his assessment of its virtues. Unfortunately, I didn’t have the Lyrita CD conducted by Holst’s daughter Imogen with which to compare, but everything I have read about those recordings would support the commonly held assertion of their definitive standing. All the same, I have gained a greater appreciation of Holst from the current issue. Several of the selections were new to me and I found all of them at least interesting and most quite captivating. I had never heard the Double Concerto before and am surprised that it hasn’t turned up more often on concert programmes. It is a wonderful work, rhythmic and colourfully orchestrated, with the unusual scoring of having the violins largely unaccompanied in the second movement, Lament. This piece is typical of late Holst, as is the rather austere Lyric Movement for viola. That work also has important parts for flute and oboe, and this performance brings out some warmth in the music that might otherwise get short shrift. The 1923 Fugal Concerto features the same woodwinds and is both idyllic and light-hearted compared with the Lyric Movement. It was composed mostly at the University of Michigan Library in Ann Arbor and presented to the university as a token of gratitude. Lewis Foreman in his informative notes to the CD refers to the neoclassical flavour of the work and its anticipation to works by Stravinsky and Hindemith. To me, the piece is more reminiscent in style of an earlier “neoclassical” composition by Grieg, the Holberg Suite. At any rate, I will be listening to it again in this delightful performance. The other works on the disc were more familiar to me. I have always enjoyed the Two Songs without Words, particularly the second one, Marching Song, in its wind band arrangement. Interestingly, the origin of that version is uncertain. It is thought that Holst rescored the piece for the Wireless Military Band, but it is not known when or why. The original version here is, if anything, more beguiling than that arrangement. The first piece, Country Song, is also very tuneful and folk-like, resembling Holst’s Somerset Rhapsody, and has delicious scoring for clarinet, oboe, and flute along with the rest of the orchestra. Both of the songs receive warm-hearted performances that do the works full justice. Undoubtedly, the most well-known works here are the two suites for strings that Holst composed for the St. Paul’s Girls’ School Orchestra. I have fond memories of a Neville Marriner recording with the Academy of St. Martin-in-the-Fields of the St. Paul’s Suite. Although the memory is now rather distant, I’m sure he found more affection in the piece than Hickox does here. Hickox really rushes the Finale with its incorporation of Greensleeves. On the other hand, Hickox succeeds with the gossamer textures of the second movement. I found less to like with his rather heavy-handed account of the Brook Green Suite, which could have been lighter and jauntier. Overall, then, this is somewhat of a mixed bag. I must say, though, that I enjoyed much of the programme and will return to these accounts of the Double Concerto and Fugal Concerto, as well as the Two Songs without Words. 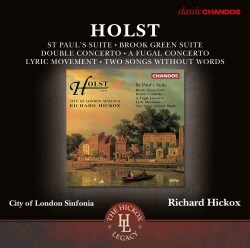 At its modest price it is certainly an attractive proposition and superior to a mostly similar collection of Holst by the English Sinfonia under Howard Griffiths on Naxos, which I sampled via Spotify and which was reviewed here by Jonathan Woolf (review).